A couple of years ago, I taught at a school where I was required to tell students their reading levels. Every time I administered the F&P assessment, students would graph their progress in a data folder. Prior to that year, I’d never before shared students’ reading levels with them. But it seemed like it could be a good way to show kids how much they’d progressed, so I went along with it (I didn’t have a choice, anyway!). But as I began sharing students’ reading levels with them, I started to get a sick feeling in my stomach. It just didn’t feel “right” to me. As time went on, I noticed some less-than-desirable behaviors in my kids – that were a direct result of them knowing their reading levels. On the other hand, I wasn’t really seeing any positive consequences of this practice. So in today’s post, I’ll share with you what happened the year I had to tell kids their reading levels. I’ll also explain the three reasons why I decided not to tell students their reading levels in the future. But before I get started, please know that I am certainly not trying to shame you or make you feel bad if you do choose to tell your students their reading levels! I think it’s wrong to make fun of certain teaching practices or teachers who use them. I have seen teachers and administrators do that, and it hurts my heart. I would never do that to you, especially because there’s no one right way of teaching! 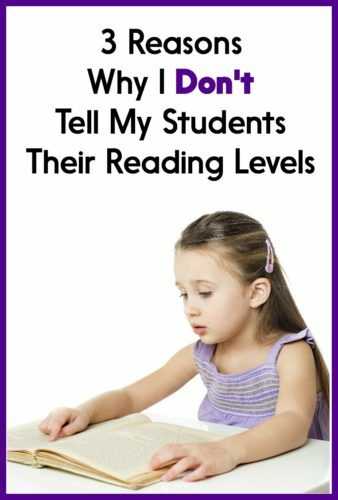 This article is intentionally not titled “3 Reasons Why You Shouldn’t Tell Your Students Their Reading Levels.” Not to make it “all about me,” but this post really is about me, my personal experiences, and my beliefs. I hope that by sharing my own thinking with you, a) it will challenge your thinking and b) you will challenge my thinking by commenting at the end. Reason 1: A reader is a reader – not a level. When we send our own children to school, we want their teachers to think of them as complete, unique little human beings, right? Not as an alphabet letter or a number? For this reason, I try really hard not to say that a student “is a Level C.” A reader is a reader, not a level. And I certainly don’t want my students to think of themselves as “just” a reading level! Kids’ identities as readers are so complex. Chris likes books about dinosaurs – but only nonfiction ones. Juliana likes to alternate between magazines and picture books. Alex has trouble with decoding, but he does better when it’s a book he really loves. None of these things can be expressed by a reading level. Another issue is that determining a reading level is far from a perfect process. Have you ever given the Fountas and Pinnell Benchmark Assessment? To administer it, you have students read books at different levels. You monitor their accuracy, comprehension, and sometimes fluency. The purpose of this assessment is to find students’ instructional and independent reading levels. When I’m finished with the assessment, I know that I’m not supposed to write more than one instructional level as the result. But sometimes it’s a little messier than that. For example, a child may read texts at one level with excellent accuracy, fluency, and comprehension. But then they really struggle with books just one level up. So how do we choose between those two levels for an instructional level? Leveling can be messy and a little subjective. If I only allow a child to read books at a certain level during independent reading, how do I know for sure that all books at this level would really be a good fit for him? I worry that telling a child he can’t read certain books will just deter him from wanting to read in the future. Kids can often successfully read books at more than one level. If a child is interested in a topic and has a lot of background knowledge, she can usually read books about that topic even when they are above her level. I can’t follow my students around to the library or bookstore. Kids are going to choose what they want to read, and sometimes they’re going to choose books that are way too hard or easy. I’d rather spend my time teaching them how to choose books that are a good fit so that they can make positive choices even when I’m not there to guide them. My classroom library is arranged by genres. Each bin has a colored sticker, so students know where to return books. Some of the colored stickers do have reading levels on them – but mostly for me. Sometimes I’ll need a book at a particular reading level so I can a) recommend it to a student or b) use it to model a strategy. Having a few books with levels allows me to quickly choose a text. 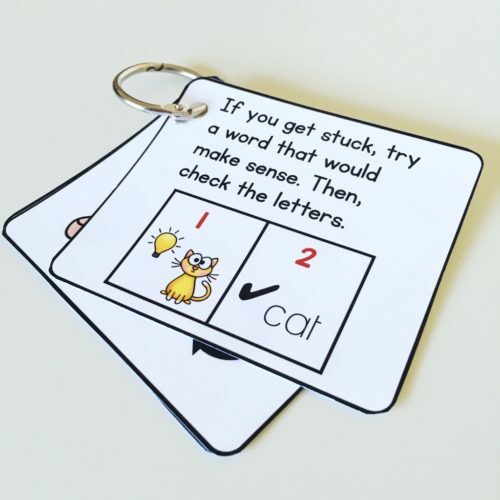 Also, if a child expresses frustration to me that they are having trouble finding books that they can and want to read, then I might say, “To get started, you can try a book that has a letter D, E, or F on it.” I don’t have to tell the child his own reading level in order to do that. And again, the majority of the books in my library do not have labels, so I spend time teaching my students other ways of finding good-fit books that they also want to read. We talk a lot about the “good reading feelings” that come when you are comfortable and interested in the book you are reading. Reason 2: A level by itself does not provide valuable information to a child or parent. When I told Sarah that she reads at a Level K, what did that tell her about herself as a reader? As a teacher who is familiar with some of the complexities of different reading levels, knowing that Sarah reads at a Level K can help me a lot! It tells me that Sarah is probably working on reading multisyllabic words. She might be learning about text structures like cause and effect or compare and contrast. She may be adjusting to books that have fewer pictures than the ones that she read previously. Pinnell and Fountas’ The Continuum of Literacy Learning has a ton of valuable information that we, as teachers, can use to learn about the differences between reading levels. In my opinion, a conversation like that is more valuable than a reading level conversation. I like to give kids individualized supports to help them focus on strategies that will be helpful to them, as readers. I give each child a small binder ring and then add strategy cards during reading conferences or small group instruction. I never want students to have loads and loads of strategies to focus on, so I try to keep 1-3 cards on there for Kinders or first graders, and maybe 4-5 cards (at most) for second grade and up. 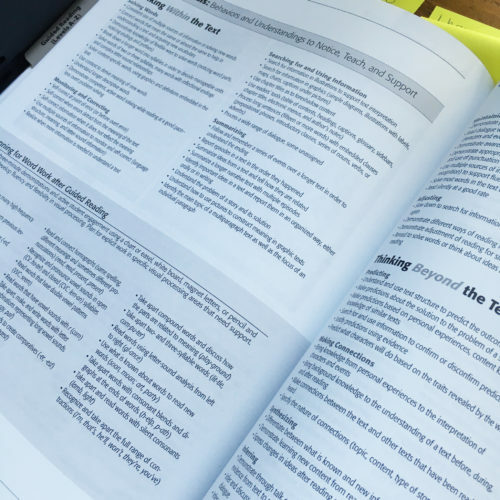 As a teacher, knowing a child’s reading level can help me figure out what strategies might be helpful to her and what I can teach her about navigating a “new” level of text. But by itself, telling a student and/or her family a reading level doesn’t accomplish much at all. Reason 3: Some kids will be competitive and compare reading levels, bringing another level of anxiety to struggling and/or reluctant readers. When I had to tell my students their reading levels that year, competitiveness was the biggest challenge I faced. I was teaching second grade at the time, so you wouldn’t think that the littles ones would act this way! But I had a couple of students who were very competitive. For them, finding out their reading levels took them on a rollercoaster ride of bragging, feeling jealous, and / or getting mad or sad. These sentiments also rubbed off on the other students. At times, it brought a “yucky” feeling to our reading environment – even though I didn’t talk to my kids about their reading levels very often. I had a couple of students who struggled with reading, and they knew it. Hearing about other students’ reading levels just made them feel worse. Their insecurities served to perpetuate behaviors like checking out books that were way too hard for them. It takes some kids a long time to develop a love of reading. Unfortunately, some students never do enjoy reading. Students will compare themselves to others whether we tell them their reading level or not. But telling them their levels makes me nervous that the competitiveness and comparisons will get worse (as it did in my classroom that year). 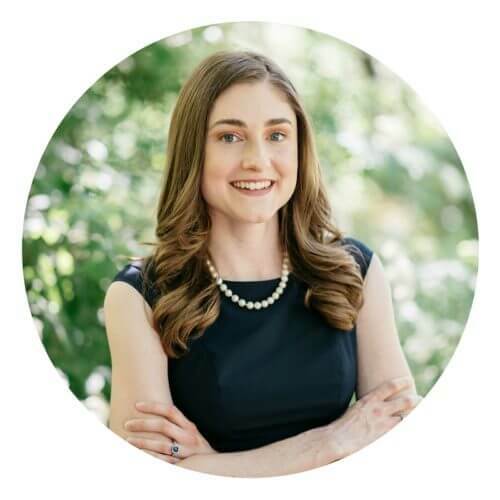 I’ve shared my thoughts and experiences – now it’s your turn! Do you agree? Disagree? Have you found benefits to telling students their reading levels? Seen lots of growth when you required students to read at their individual levels? Please comment below – I’d love to hear from you! Pinnell, G. S., & Fountas, I. C. (2008). The continuum of literacy learning, K–8: Behaviors and understandings to notice, teach, and support. Portsmouth, NH: Heinemann. The first chapter book was supposed to be “chapter nook.” Spell check ???? My school is starting to use data binders this upcoming school year. In previous years I have not told students their reading level as I have also felt it does more harm than good. I am interested to see how using data binders will change these practices! Very interesting topic, thanks for sharing! I hope it goes well for you, Kristen! It will definitely be interested to see if there are any changes in the kids. Hopefully only good ones! 🙂 Thanks for reading and commenting! I enjoy reading your posts and I use your Tpt items a lot! I do tell my students their reading levels to help them understand their growth. I show them their assessment graphs also. I also show them in our library where they can find their level of books in the non fiction and fiction sections. Our library is level coded on each book. I am a special education teacher so the kids I work with are in small groups and are working on goals. No competition. They get excited when they see their accomplishments in their data. Thanks for sharing your experience, Janet! I do think that goal-setting and being able to see accomplishments is one of the really good parts of sharing data with kids. And I am so glad to hear that your students don’t worry about each other and just focus on their own goals! I’m sure you have a lot to do with that, too – setting up a positive classroom environment where kids are focused on their own growth! I totally agree. I taught special education for over 32 years and witnessed first hand how my students reacted when placed in “level” categories. They were devastated. I want my students to enjoy reading, therefore I spend a lot of time reading to them. Thank you for such a great article. Thank you so much for sharing your experiences, Melissa! It sounds like you did a fabulous job of creating a positive and supportive classroom community with your little ones. I have had the same experience. My students are excited to see their growth and support each other. It has been a positive experience! What do you feel is the best assessment to use on first graders for checking their reading leveland how often do you assess them? Pamela, thanks so very much for sharing your experience – it’s so helpful to hear from a parent’s perspective, too. I am so sorry that happened to your daughter! 100% agree that data is a tool for teachers, and when we use data with children, we have to be mindful of how we present it to them.